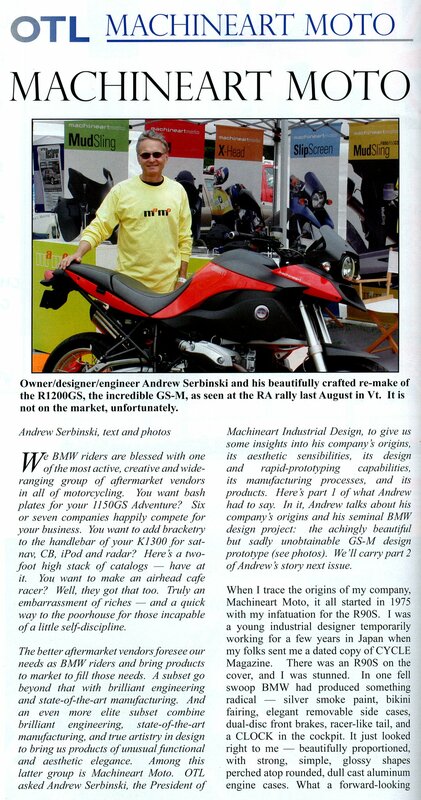 A comprehensive article about MachineartMoto, its origins, design focus and product development process is featured in the December 2010 issue BMW RA Club Magazine OTL. It is the first of two segments, the next of which will appear in the forthcoming January issue. The entire text is below. When I trace the origins of my company MachineartMoto, it all started in 1975 with an infatuation for an R90S. I was a young industrial designer working in Japan for a couple of years when, in a dated copy of CYCLE Magazine sent to me by my parents, I saw the R90S on the cover and was stunned. In one fell swoop BMW produced something radical – silver smoke paint, a bikini fairing, elegant removable side cases, dual disc front brakes, racer-like tail, and a CLOCK in the cockpit. It just looked right – beautifully proportioned, with strong, simple, glossy shapes perched atop rounded dull cast aluminum engine cases. What a forward-looking and beautiful piece it was from such a conservative company and thoughts of it kept me awake at night. After returning to New York in ’75, I withdrew $3800 of the $4000 I had in the bank and bought one in Daytona orange. A brash move for someone whose wife at the time only wanted a vacuum cleaner and found the funds nearly depleted. Today, I still have the R90S. The publicity lead to the design of an FIM 250cc GP racing team graphic identity for Optimum Power Technologies, a virtual engine design software development company in Pittsburgh that sponsored a privateer Aprilia ridden by Jeremy McWilliams. The bike, transporter, shirts, hat graphics etc. we designed all made the team really stand out on the track and made it look like a bigger budget operation than it actually was. Then, an opportunity came along to prepare styling concepts for the ST4 and a new “Super Monster” Power Cruiser – just now being being introduced in Europe an not of our design – to Ducati of North America when they were still in New Jersey. 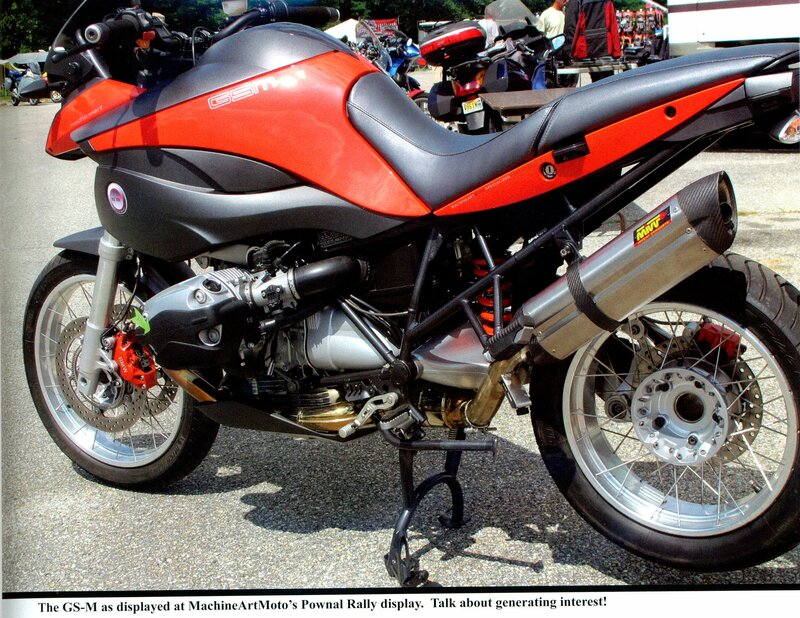 And, most interestingly, a project for start-up eCycle www.ecycle.com outside of Reading Pennsylvania to design concepts for three variations of a gas/electric hybrid motorcycle to promote their brushless motor/generator and controller technology. The portfolio began to build. The standard GS looks hunky rough and tumble and broadly capable, yet it usually does not live the life for which its designers dressed it. The majority of them are used as sport tourers and big sport bikes on pavement, rendering their dirt bike derived look somewhat out of place. Its platform extension mate to one side, the Adventure, is positioned to fill the more seriously equipped ride around-the-world role to solidify the position the standard GS cannot claim. At the GS’s opposite side there exists a void – an opportunity for another variant that retains all of its broad capability, but doesn’t pretend to be a Paris-Dakar racer. Many riders have told me they like the idea of the GS – no fairing, big load handling capacity, with lots of luggage, windshield and comfort customization options – but don’t identify with the two-wheeled Land Rover look. The GS_M is designed for those riders – a proposal for a second GS platform extension designed to look right for sport riding, while not compromising its off-road goodness. When exhibiting the GSM many people have told me that if the GS looked like it, they would buy one, especially if it were priced like an R1200R. With a lowered suspension, it could well be a more exciting replacement for the R1200R. I began sketching GSM ideas with the intent of retaining the GS’s muscle tone, but making it leaner, more finely chiseled, smaller and lighter looking. A visual device I used was creating a flow of line from the nose to the tail without hiccups. That is, without continually stopping and starting the flow of the eye from one end to the other. It’s a classical notion of guiding a viewer’s eyes over a sculpture, an automotive form or around a painting in a way that enables one to absorb the whole by taking it in uninterrupted. A beautiful woman’s body, a cougar stretched out at full speed, a stalking shark are all natural forms that the eye flows over unimpeded from tip to tip and, as attractive or menacing as they may be, can all be agreed upon to be beautiful. The GSM, with its mission as the streetwise version of the GS, is designed with the flow of form and beauty in mind. There is a whole other realm of form that does not comply with this principle but can be agreed upon as having character. When you look at a standard GS, its shapes deliberately elicit the feeling that it was constructed to do a specialized job, with every piece complete unto itself for its own purpose within the system and with no regard for how it relates to anything else. That visual dissonance, the hiccups as I call it, is not beautiful, but does create a distinctive character. It is the Land Rover aesthetic, with its winches, jerry cans, racks, and spare tires stuck on all over and looking “ready” to meet every challenge. It has an appeal, but it’s not for everyone. My work commenced in 3-dimensions on top of a new GS, mocking up the body surfaces in foam plastic and clay to capture the feel of the selected sketch. The work included parts that had to be considered to make the bike a complete statement: those iconic cylinders poking outwards needed protective guards, the windscreen – annoyingly noisy on the stock bike for a medium height guy like me – needed acoustic improvement, fenders needed to be though of anew. The process began to take a long time and it became apparent we needed to leverage the effort being put into the design and prototyping of these ancillary pieces into production parts usable on standard GS’s to generate revenue while the rest of the design was being completed. We invested in tooling and production for the MudSlingÔ rear fender, X-Head cylinder guards, and Slipscreen sport shield prior to completing the GSM, launching MachineartMoto and the dealer and web site sales effort. The GSM served as a development platform for ideas and it would become the symbol of the design focus of the Machineart “Moto” brand. The GSM is a jewel and at rallies riders naturally ask “How much does it cost. Is it available as a kit? The answer is – ” It’s a design study and not available.” To someone who’s drawn in but cannot have it, that’s not a good answer. The reason is that developing a prototype, as complete looking as the result may be, is not necessarily suitable for series production as is. To make it so would require another round of detail engineering to make sure the parts will mount easily, stay mounted under all conditions and not fracture from vibration and normal use. Then a tooling investment would have to be made for production in enough numbers to justify the whole effort. Worldwide, there certainly would be a market for a high-buck, exclusive GS alternative, but the numbers would be small and the cost involved to do it right would not be reasonable for most people. The GSM will, therefore, remain a design study, but the Machineart Moto products it spawned are available today for use on anyone’s R1200GS.